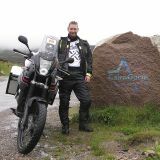 Once Ive recovered I`ll knock a ride report up as it turned out to be quite an epic with one thing or another! Thank you! I was just writing the second part when you posted! Just got it right with the weather (although it was effing freezing coming up the A1 early this morning, I was so so tempted to leave it at 19 as I past the York turn off!) and my lovely GF Sophie has to be thanked for egging me on! Will you get chance to finish? Fantastic have a karma for your determination. Well done matey – welcome to the club. Which destination / area was your favourite? Lee wrote: Well done matey – welcome to the club. I know what you mean about Glen Trool – the fact that it was one of the few places that it didn't rain might have helped, but the views from Bruce's Stone were simply stunning. It was the first time I'd been to Dumfries and Galloway. It certainly won't be the last. Well done mate, that shows proper determination to get the job done.